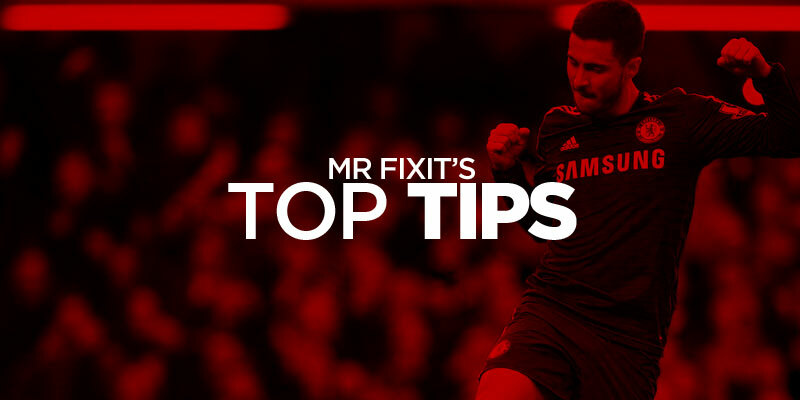 Home Mr Fixit’s Top Tips: Man City set for big win but where is the value? TUESDAY was a busy night with plenty of winners and let's hope for more of the same on Wednesday. My both to score treble won at 16-5 without a sweat but my run of Super Single wins ended as Tranmere's bid for eight in a row was beaten by Oldham. The Top Treble was in a winning position until Ayr conceded an equaliser to Morton so a small profit on the night. Greg's Nap won again with over 2.5 goals at Wolves and Serie B goals bet also came in while Scott's member's bet was also a winner with Watford and over 1.5 team goals – and he's posted another for tonight. Kevinmac also tipped over 2.5 goals at Wolves and he has posted a preview of Man City v Cardiff. City's game in hand over Liverpool is one of three big Premier League games on Wednesday and they should win easily against a side whose boss Neil Warnock is threatening to rest players ahead of a meeting with Burnley at the weekend. Chelsea v Brighton and Spurs v Crystal Palace are the other two fixtures and the home teams will be looking to take advantage of Man United's dropped points at Wolves as the race for the third and fourth Champions League spots hot up. There's a full card in the Scottish Premiership and I've posted a Scottish preview including St Mirren v Celtic and Rangers v Hearts. Saints have actually rested half a team and Celtic have made changes too with Odsonne Edouard benched and Oli Burke and Timo Weah starting. Maybe take James Forrest for first goal. Loads of games in Europe's top leagues too and I'm starting with a both to score treble. Five of Roma's last six have brought up this market as have Fiorentina's last six. It's a mixed bag on the h2h but this season in Florence it was 7-1 and 1-1. Add Torino v Sampdoria. Three of four on the h2h have come up and both sides' last four matches have seen both score in three. In Italy SPAL v Lazio also has a chance. Complete the treble with Valencia v Real Madrid and if it's half as thrilling as last night's 4-4 draw between Villarreal and Barcelona then we're in for a treat. The last six meetings at the Mestalla have seen both score with the last five also going over 2.5 goals so there is the promise of thrills and spills. Nothing fancy about the Top Treble and I'm going with Chelsea, over 2.5 goals at Empoli v Napoli and Athletic Bilbao. Chelsea really need to win and with Callum Hudson-Odoi set for an overdue start I fancy them to take care of a Brighton who are capable of making life difficult for anyone. Napoli have been in decent form netting four in each of their last two matches against Roma and Udinese. They beat Empoli 5-1 at home in November and on the h2h the last three meetings have gone over 3.5 goals. Bilbao are targeting a Europa League place after climbing the table with four wins in seven after one victory in their first 14. It's a great turnaround and Levante, five away defeats in seven, face a tough task here. I was on a good run of Super Singles until Tranmere let me down last night. I'm taking a chance with Hibs at home to a decent Kilmarnock side who are six points above them. However, like Greg I've been impressed with Hibs under Paul Heckingbottom and he's suffered just one defeat – against Celtic – since replacing Neil Lennon. Killie have won just one in seven at Easter Road and crucially could be without two key players. Striker Eamonn Brophy is out and their best player, wideman Jordan Jones, was a doubt but does start. Another side I considered for the SS were Werder Bremen at just under 2-1 at Schalke in the German Cup quarter-finals. Bremen won 4-2 at Schalke in the Bundesliga and are unbeaten since Christmas. Should win or at least draw to force extra time. Admittedly my bets aren't too exciting tonight so I've added a 0.5pt long shot just for funr. If Warnock rests players then he wants the sack as they are 5 points adrift,Aguero is out also for Man City. He should rest players in my opinion – Cardiff will lose this game whatever team they put up. Save them for the Burnley game. He won’t be the first manager to rest players this season. Probably the first manager to rest players when they are 5 points adrift,if that’s the case they may as well not turn up lol,Warnock has a big problem with LFC so he won’t do us any favours haha.If City are going to lose a game it will probably be against a lower team. Squeaky bum or paranoia? Going to be a long run in for you Macca my friend. If Cardiff were to rest players against Liverpool ,im sure you would be all for it Macca. Smaller stakes punt on o2.5mgs four fold in the same games… Prices are huge, probably for a reason but it’s 46/1 so will risk it at that price. Bet ITV4 viewers enjoyed their FREE footy game today. Then Villarreal bang in 4 interspersed with 11 yellow cards and a red, then Messi and Suarez score in injury time to make it 4-4. Can see man utd scoring 1 or 2 v Barca, trouble is I see Barca scoring 3 or 4, but football is a funny old game innit !! Should see goals this one, 5 of Roma’s last 6 league games have seen btts. 6 of Fiorentina’s last 6 league games have been btts. 12/14 of Roma’s home games have seen btts with only 1 clean sheet. They’ve conceeded 43 goals this season in the league and 12 in there last 5. 10/15 Fiorentina’s away games have seen btts including there last 5 away games. Going for a penalty trixie tonight. Penalty taken at. Also going for 3 + corners each half in the 6 SPL games. 5/1 Skybet. Australia Tasmania league this morning sees Clarence United play away at Hobart Olympic. Clarence are woeful and have lost their first games this season 9-0, 8-0, 5-0, 13-0 and 9-0. 9-0 with 2 mins left guess the goal line was spot on. Well worth a punt . A lot of games that on paper based on recent form and H2Hs look decent for BTTS in Italy, France, Holland and Belgium. yes – well apart from the treble! At least they left you the car! Defo wasn’t me i would of taken the car!! Advice please guys, got a £50 free betfair bet token to use up before the end of the 4th. Gotta take 1/5 or better. Anything stand out either today or tomorrow worth looking into? Loads of bets – take your pick. Are you going short or going big? I’m not looking for a bank-buster, but a trio of selections around the 1/2 – 8/11 price range. If I take a single and try roll the single, if it lands, they take the £50 back and it nullifies the value of the rolling acca, so ideally, I really need to be placing a treble or a 4 way at max. I appreciate that nothing in gambling is a certain, its all about risk. I can however place a bet today and I’m thinking maybe a treble, with possibly one eye on a component that takes place tomorrow. I need to check the small print, I don’t think the bet has to be placed and settled before midnight at the end of the 4th, I think the bet JUST has to be placed before 23:59hrs 4th April, so maybe there’s wiggle room to find one decent pick from the next 4 days and drop it on a 4 way. I do also have one eye on Derby away to Brentford. I know Brentford had a good home game with a 3 nil scoreline but Derby mauled Rotherham too at the weekend and that 6-1 I’m confident will spur them on to a good run. They’re 5/2 to beat the bees with most firms, I’m quite optimistic in believing they’ll cover a -1 for a big odds boost. It was sh*t or bust with Mason Mounts first game back and he came back with an almighty bang after 10 games out. It feels like we’ve just signed a new player. Johnson has started to also play like the midfielder he used to be with Norwich and Waghorns hattrick is keeping Marriott on the bench. I dunno why, but suddenly Derby are starting to click. So possibly, the way forward is a 4 day – 4 way acca finishing ( hopefully ) with a -1 h/c Derby win at the weekend. Nothing special. Trying to build my bank. 2 bets for me tonight. Schalke v Werder Bremen. Both these teams are polar opposite in terms of form and results. I’m with Werder Bremen to qualify 1.90 bet365. Huesca v celta Vigo. This is a relegation scrap and would not be surprised to see a hell of a lot of bookings and possibly a red card. 60 or more booking points 1.80 skybet. Atletico v Levante also looks great for cards but prices are skinny. One for in play. Huesca regularly pick up 3/4 bookings in their games, so your bet looks promising. I took them for 3 or 4 against Real Madrid at the weekend, and 3 landed. Had a small bet up last night so may or may not try it again tonight, had BTTS and Over 2.5 in the treble put up by Mr F….paid 37 from a fiver so not bad. Quick post – insanely busy at moment but back to normality come the weekend! Easy way out for you is to back goals and go under for corners. Also do you know Man City have averaged 8 corners a game this season in the Premier League so HullShaker is asking them to have one more which you’d think was possible against a team in the relegation zone. They are the corner kings ahead of Liverpool and strangely Crystal Palace. Just to add yinka4dad I won the same bet Man City v Fulham hense the reprise. Appreciate your input @yinka4skin – like I said, not had much time to write up recently but certainly still putting the time in looking before picking out selections. For your information, it’s a 1 point Betbuilder I’ve gone for so neither here nor there in terms of breaking the bank. “City hardly play corners”? Not sure what that means really but they top the EPL corner table with just shy of 8 per game and are 29 clear of Liverpool in 2nd and 63 clear of Palace in 3rd. You may also be interested in the fact that Cardiff have conceded more corners than any other team with 6.58 per game. Nine now. No problem anyone going against HullShaker but don’t accuse of a bad tip before the game’s even started. BTTS/OVERS at Rangers, Spal & Spurs 11/1+ wi MoPlay plus free fiver win or lose. Won’t touch Celtic until I see teams. I could bet £50 on a treble of Celtic -1, Man City -1, -1.5 and Rangers DC, returns £83.90. What could possibly go wrong ? Should be OK but much depends on how Defoe plays with Morelos out. It’s a rare start. bit better not been on a great run of late……………. tonite, weah starts for celtic and st mirren have made 6 changes ahead of their crucial game at the weekend v hamilton………..
Got to fancy Celtic strongly – looks like St Mirren boss Kearney has said let’s just get this out of the way. Edouard rested too so maybe Forrest to score first. Thanks Paul, I am quite tempted to try for it. Maybe it is also an idea for Nathan’s free £50 bet…. rubbish in switzerland all round bar Basel game. I know mate, I share your pain, I only needed them to score 1 in the 2nd half, W@nk3rs. Blown out by a 0-0 ! Have had better nights . Well done all winners . pish from me ..one winner from 1.5 stake … so no real damage. WD the winners! Need a Real goal for a second treble. Taking their time. No luck for me tonight. Cheers guys. Had given that one up to be honest. Nice night of profit. A 92nd minute Roma corner bringing up the full house. Well done all winners tonight! Ouch. One card short in Huesca. Finished with 5 but needed 6. Ldvante v bilbao had the cards and was one for in play. Hope someone managed to get on. 5/1 punt LOST but main 13/10 landed…………….. Typical could of sworn your top treble said Napoli (to win). Must of read it wrong. It was always over 2.5 goals – check out the reasoning. Based totally on h2h stats.